"I really like the piano course because it has given my daughters an opportunity to use their talent at church." "It's a real thrill to see teaching material open the door to talking about the things of the Lord." "My daughter (9 yrs. old) has played some of your arrangements from your Grade One book at the local nursing home services. Those people love it and always ask for more. We are fundamental Christians and I am pleased with your selection of hymns in Book One." "I'm 69 years old and I'm writing to tell you that I love your music course." CLICK AND GO TO STORE HERE! THIS PIANO COURSE HAS BEEN AVAILABLE THROUGH MAIL ORDER FOR OVER 35 YEARS AND ENJOYED THROUGHOUT THE WORLD. It's never too late to start piano lessons! 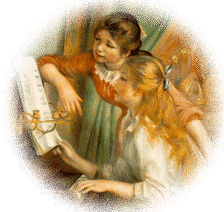 CHRISTIAN KEYBOARD INSTRUCTION IN CLASSICAL STYLE FOR MISSIONARIES, HOMESCHOOLERS, PIANO STUDENTS, & TEACHERS....Give the Gift that Keeps On Giving - The Gift of Piano Music Lessons! 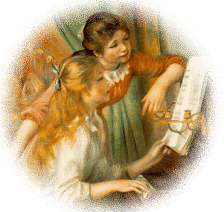 With this Christian piano course YOU OR YOUR CHILD CAN LEARN HOW TO PLAY the old Gospel Songs and HYMNS from the VERY FIRST PIANO LESSON - the Mary Jo Moore Piano Course will teach how - even if there is no prior training. Start playing the old hymns today!" FOR OUR CATALOG OF OTHER MUSIC ARRANGEMENTS AND BOOKS BY MARY JO MOORE, PLEASE CLICK HERE! THE MARY JO MOORE PIANO COURSE, ("WITH A SONG IN MY HEART"), is a complete 5 volume piano course for adults and children, based on the old beloved hymns of the faith in the classical style. Music theory is incorporated along with the music. DEVELOP YOUR TALENT FOR THE GLORY OF THE LORD! Preparatory Book and Grades One through Four - COMPLETE 5 VOLUME SET is $59.95. Domestic Orders: Your order will be shipped via US Postal Service. Please allow 1-2 weeks for delivery. Thank you. Overseas Orders: Please allow 4-6 weeks for Delivery and send USA Funds via Bank Cashier's Check or Money Order. International shipping charges will be applied to your order. Thank you. THERE IS AN UNCONDITIONAL GUARANTEE AND YOUR MONEY WILL BE PROMPTLY REFUNDED IF YOU ARE NOT TOTALLY SATISFIED WITH ANYTHING THAT YOU ORDER. May God Richly Bless You Today! Thanks for Visiting! All music books and tapes are available through mail or phone order. This music is NOT available in stores. Want to hear Mary Jo Moore play some of her beautiful Arrangements? Her Compact Disc, CLASSICAL KEYBOARD REFLECTIONS OF CHRIST is Now Available from Mary Jo Moore. These are only $12.95 and make excellent gifts. Click play to hear the Mary Jo piano arrangement of "The Ninety and Nine"; one of the arrangements from her CD.